The flows of refugees from the Middle East and Northern Africa are not affecting the migration situation in Russia, Russian Foreign Minister Sergei Lavrov said. "There is no indication that the wave that is now going to Europe will have any influence on the [migration] flows that are going to Russia in any case. 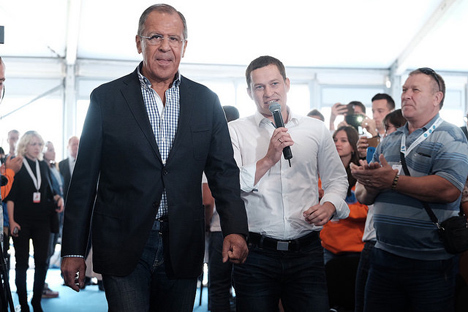 We are now taking very tough measures, primarily the Federal Migration Service in cooperation with the Foreign Ministry, to bring order to this sphere," Lavrov said at the all-Russian youth forum Territory of Meanings in the Klyazma area on August 24. The main emphasis in this case is on "bringing labor migrants from the shadows to provide them with legal and decent living and working conditions," the minister said. "Accoridng to estimations, Russia is the second most attractive country to migrants if you take absolute numbers, the number of people who are working here and who would like to work here. We are, of course, interested in them being citizens of the CIS countries," Lavrov said.